The colour scheme I chose for the Star of Luxor quilt block was intended to reflect the sky at night. This block was new to me and right away I could see it could be easily simplified. If you are a regular visitor to this site, you know that I often make the construction of some of the blocks easier to sew. 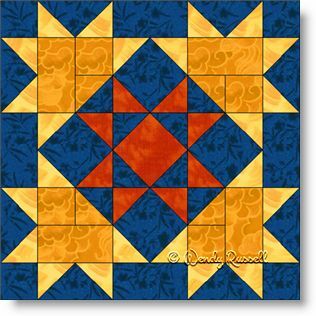 For this block, I replaced many of the half square triangles with flying geese units and in some cases, with squares on point which reduces the number of seams and therefore producing less bulk. Lastly, I constructed it as an uneven nine patch rather than in single rows. The sample quilts illustrated show both quilts using settings on point, although using a side by side layout of the blocks produces interesting results as well. The sky's the limit (... sorry, I couldn't resist ...) with the layouts you may come up with for your personal quilt.